A communal space, named for the Union Pacific Railroad, symbolizes the conjunction of multiple entities. 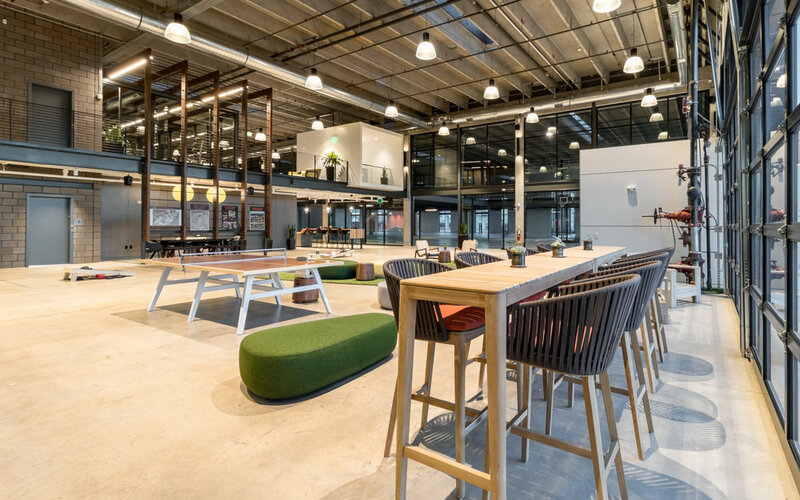 Designed for employees to work, play, and everything in-between, Junction 23 features a dynamic open layout and voluminous ceilings, with function and flexibility in mind. A glass-lined perimeter and numerous sky lights offer natural light throughout the space. The original name of Junction 23, Denargo Market, is a combination of Denver and Argo. Argo Gym is the perfect place to keep up with the Denver lifestyle. Exercise equipment and room to stretch only a few steps from the office is ideal for any busy schedule. The facility also includes on-site showers and locker rooms. Clyde Fruit and Produce Company pioneered the most modern processing equipment at Denargo Market. Now, Clyde Bar is a place to fuel creativity and innovation. Clyde Bar includes self-serve coffee machines, beer taps, and more. The perfect place to take a break, gear up, or wind down for the day. Millar E.B. Coffee Co., the only independent coffee company left in Denver at the time, opened a coffee plant at Denargo Market. As an outdoor extension of Junction 23, people can sit and relax here imagining the sweet smell of coffee that once wafted through the air. Roll-up doors also allow employees to get out of the office without ever leaving the building. Louis Smaldone, the market master, was in charge of the administration of the Denargo Market since it first opened and took great care of the vendors and community. The Louis View is a space to collaborate with the latest technology. It floats above the hustle and bustle of the Union just like Louis did at the Market. You have just the right amount of privacy in this enclosed, sleek, white area, allowing it to function as a co-working space to fit all of your needs. Rossi had the childhood dream of wanting a restaurant, and he succeeded opening Rossi Denargo Market in the 60's. People would come from all over Denver to eat the Italian food he made alongside his mother. The Rossi Room is a place for ideas, providing additional gathering space in a less formal setting. Located on the second floor, an oversized trellis secludes you and your company from the office buzz. The Den is a small conference space located on the first floor and has all the latest technology. Perfect to use as a co-working space for any occasion with it’s central location. This semi-private space puts work on display and complements formal conference and meeting rooms that may be found within the tenant spaces themselves.